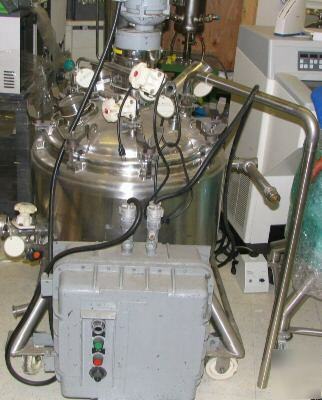 Used DCI 150 Liter / 40 gallon type 316 stainless steel sanitary reactor. Internal rated 30 psi @ 320 degrees F. Jacket rated 75 psi @ 320 degrees F. Clamped dished top. Conical bottom. Top mounted agitator 1/4 hp 1725 rpm 3 phase 230/460 volt with varispeed drive. Top sight glass. Center bottom outlet. Baffles. DCI s/n 83PH29322. NB 614. Built 1983. Mounted on 4 castors. Stop/Start Controls.